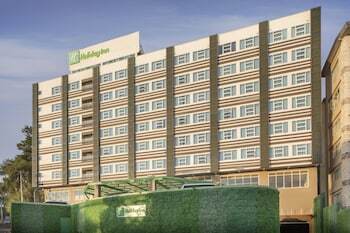 A stay at Holiday Inn Baguio City Centre places you in the heart of Baguio, a 4-minute drive from Burnham Park and 8 minutes from Baguio Cathedral. This 4-star hotel is 2 mi (3.3 km) from Teachers Camp and 2.2 mi (3.5 km) from Camp John Hay. Make yourself at home in one of the 185 guestrooms featuring minibars and LCD televisions. Complimentary wireless Internet access keeps you connected, and cable programming is available for your entertainment. Bathrooms have complimentary toiletries and bidets. Conveniences include phones, as well as safes and desks. At Holiday Inn Baguio City Centre, enjoy a satisfying meal at the restaurant. Quench your thirst with your favorite drink at the bar/lounge. Breakfast is available for a fee. Tanaw Presa is a newly furnished modern guesthouse overlooking a wonderful view of the Strawberry fields. The guesthouse features a very wide parking space, a rooftop to relax and view the amazing scenery, CCTV security, balcony, cooking amenties, co... Tanaw Presa is a newly furnished modern guesthouse overlooking a wonderful view of the Strawberry fields. The guesthouse features a very wide parking space, a rooftop to relax and view the amazing scenery, CCTV security, balcony, cooking amenties, complete with tv's and a mini library (big units) for entertainment!